Let me start by saying that waiting to exhale does NOT refer to the recent passing of Whitney NOR does it have anything to do with love like the book/movie of the same name. What it DOES have to do with is a(nother) major life change. You see, in case you didn’t already know from any of my posts, living and working and Germany has handed me a few blows. Ok. A lot of blows. I’ve faced legal action, major plumbing issues and being accused of stealing my neighbors bike. And that’s only my personal life. I won’t even get into my work life. So after the Deutsche bahn legal action, I vowed to move on. I believe we have two choices in life: accept it or change it. So for the past 6 months, I’ve been mulling over what accepting it means to me. And I didn’t like it, so changing it was the only choice left. Though my first year of living on another continent felt like it was going to kill me at times, moving back to North America didn’t seem like a valid option. For one, besides an insane amount of vacation, I actually enjoy living on the European continent. Yeah, most people missed the memo on skin and lung cancer and I feel like I could support a small family on the taxes I dish out each month, but I generally like the openness of most people and all the ex-pats. Also, 6 weeks vacation is handy to tour around the continent especially since a 6 hour drive can mean passing thru a handful of countries. Talk about bang for your buck vacation wise. And so it is, that I will be up and moving to Southern Switzerland. I already feel that Southern Switzerland and I will get along fabulously. It reminds me a lot of Vancouver with mountains and water. Also, from everything I’ve read about Switzerland, is that it’s a bit rogue. In the sense that South of the Alps, things are a bit different. It’s still Switzerland, but it’s the only area where Italian is spoken. In fact, in my research it seems to take the best of Switzerland like a great quality of life, no corruption, trains that run on time while taking the best of Italy like language, food and culture. It’ll be by far the smallest place I’ve ever lived population wise, but living in Germany has taught me I have the ability to build a social circle from scratch. Also, since it’s only a 4.5 hour drive, I’m hoping that area is enough of a draw for my friends to come visit me without having to kidnap them and handcuff them to my dining table. 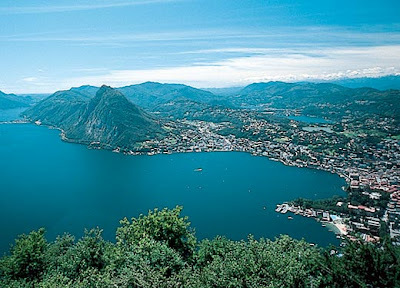 Lugano is a bit of a posh tourist destination so I might not even have to go far to discover all kinds of fun places. 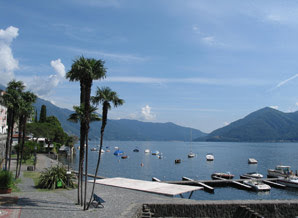 I mean, I’ll essentially be living about a 40 minute drive from George Clooney’s Lake Como summer home. When I went to Lugano for the job interview, it reminded me a bit of Vancouver, the Okanagan in British Columbia and Italy. And since those are 3 great places, I’m pretty happy. Also, there were palm trees. Seriously. I’ve never lived in a place with palm trees. I think of Switzerland as the land of snow and Saint Bernards and the place I’ll be living in has palm trees. Also, the temperature of the lakes in August is 24 celcius. We have a lot of lakes in Canada, but most of the ones I’ve swam in are likely to give you brain freeze even in august! I don’t expect that my life will be the hub of social activity it is now, but if I get to swim in lakes and hike after work, I’m willing to pay the price. Oh, and kidnap my great Nurnberg friends for visits. Churchill once said "If you are going through hell, keep going." Not bad advice, really. Safe travels my friend, and may your transition/egress out of Germany be easier than ours... which at 7 months and counting isn't a difficult target to shoot for. Get that guest room ready!